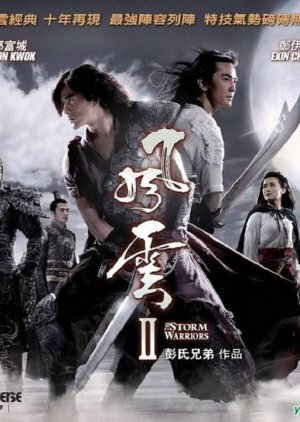 As with the previous installment "The Storm Riders", "The Storm Warriors" is adapted from the "Fung Wan" manhua series created by Ma Wing-Shing. The film will focus on two of the most popular story arcs in the manhua series - 'Japanese Invasion' and 'Death Battle'. ~~ Japanese evil warlord Lord Godless desired to conquer China. He imprisoned a large number of martial artists and tried to make them subjugate. Among the prisoners were Cloud and the martial arts elder statesman Nameless. Wind came to the rescue. The trio was badly wounded by Lord Godless’s evil martial arts attack. Chu Chu was also knocked out when she blocked Cloud from Lord Godless’s strike. The remaining martial artists sacrificed their lives to save the trio, in the hope that the trio would beat Lord Godless one day and save the country. Lord Godless took The Emperor in captivity and stationed his troops in Heaven Cave. Cloud arrived alone and started a combat with Lord Godless. Lord Godless had the upper hand. In the meantime, the half-evil Wind appeared and joined the battle. During the fight, they inadvertently discovered the secret of the sovereign. The real intention of Lord Godless’s invasion was related to an ancient tomb, a forbidden ground buried with the Royal family’s secret. The truth was finally revealed. At last, how would the battle end? Who would eventually rule over the country?